I may not have told you this, but I’ve been bothered by what I thought of as ‘heart palpitations’ for a while now. It got particularly heavy after getting back from my last Alps climbing weekend with John, so I decided to see what the French health system had to say about it. 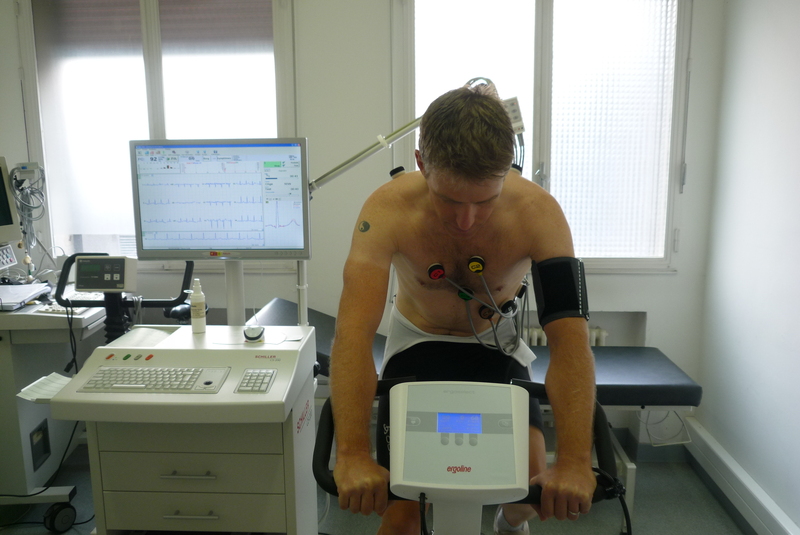 After 1) a blood test 2) an ECG 3) an echo-cardiogram, and 4) a 24-hour ECG, I got to ride my bike with my shirt off! This last test (stress test) was to confirm that my palpitations didn’t occur under stress, which, my good doctor assured me, would be cause for souci. The test was kind of fun, as you can imagine. It involved pedaling at a steady cadence of 70, while resistance increases at two-minute intervals. This resistance, by the way, is measured in watts, so as a bi-product, I could also see what kind of power I am producing without forking out €500 on a power meter. Here are the results. I like the numbers, even if I have little idea how to decipher them. But back to my heart. 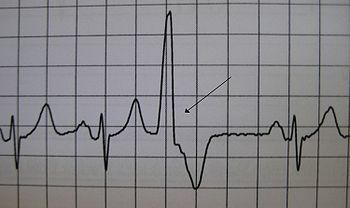 Dr. Tailland says that I have Premature Ventricular Contraction (PVC), which is pretty common and, according to him, nothing to be alarmed about. No medication, don’t need to change my training, nothing. So, thanks great French health system that pays me back nearly everything I pay out (a little over €300 for everything, including this test that the doctor needed to travel to do). And thanks, Dr. Tailland, for taking the photo. It’s perfectly framed! This entry was posted in Cycling and tagged premature ventricular contraction, stress test. Bookmark the permalink. A curious progression of heart beat against output. Were you taking sneaky breathers? Glad your heart is OK.
Not sure how that happened either. I think my cadence must have dropped a bit as it got harder. Couldn’t hurt, I’m sure. I asked the doc about coffee and he said as long as drink fewer than 5 a day I should be fine! Was that a French Doctor? I guess 5 demi-tasse of gravy thick coffee could be regarded as ctting down on caffeine in France. Thank you for noticing, Ron!